The end result was pretty fascinating. Since he was more or less a fan of the post-TUF era, he could learn his own version of historical context as he went along and also, simply look at each fight on its own merits. How competitive were they? What was the level of training? How did the sport evolve from 1993 to today? It was one fan’s perspective, sure — but it was refreshing to get that take without anyone trying to sell you anything. He lasted to the beginning of my favorite era in MMA, the early 2000’s, before he either got bored or found a job. I’d love to link the thread, but like a lot of great things from the past (that forum’s epic thread about ramen comes to mind) — it seems to be gone. But it gave me the idea to do the same — but with PRIDE. I thought of the old days, scouring Japanese video stores for MMA — long before a fight could be watched on my humble 56k internet connection. I hadn’t seen a lot of these shows in years. 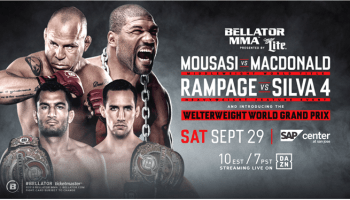 Hey, it’s all there on Fight Pass now. Why not take advantage? 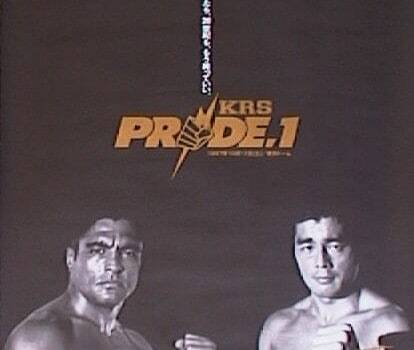 Whatever you call it, that first PRIDE show was a phenomenon, with a huge crowd packing the Tokyo Dome to see Japan’s pro wrestling icon Nobuhiko Takada taking on Rickson Gracie, who had beat down Takada’s training partner in a challenge match at his dojo and won several Japan Vale Tudo tournaments. It was an epic event; while no one could predict the future in Japanese MMA, it was really a mainstream happening. I know that because I was plugged in to the pro wrestling scene around this time. But there’s no sense of that watching it on UFC Fight Pass today. We never so much as see the crowd — said to be 47,000 strong. “Look at how huge this place is!” Bas Rutten yells out on commentary early in the broadcast. Unfortunately, we have to take his word for it. Rutten (and Stephen Quadros) were not actually in attendance, and added their English language commentary long after the event was complete. The show begins with Kazunari Murakami recording a quick submission win over John Dixson. A pro wrestler by trade who fought in MMA in scattered shows from the late 1990’s to early 2000’s, Murakami scores a nice hip throw followed by a few punches and an armbar from side control to end it. It all looked a little shaky, and the specter of “work” hangs over, but Dixson may just not know much about fighting. There are no introductions to speak of as we move on to Gary Goodridge vs. Oleg Taktarov. UFC 6 tournament champ Taktarov lands a 3-2 combo nicely early in the bout, which may have worked against him, as with that success he seems to begin thinking he can stand with “Big Daddy” Goodridge. Goodridge proceeds to pick him apart standing, with a big right hand knocking the Russian legend out cold at 4:57. We hear random commentary within the ring after the big knockout. “I felt it break.” Goodridge says, regarding his hand. “Carry that fucker out on a stretcher.” Ouch. You can also hear Gary saying, “I love you man,” and sharing hugs and kisses with his cornermen as Taktarov is stretchered off. These were just simpler and more brutal times. Next, Akira Shoji fights Renzo Gracie. It’s a long bout with many stretches of inactivity. But that was the order of the day. Renzo is scoring most of the offense, but Shoji is hanging there and getting in a few strikes here and there. As always in this day, there’s a sense of confusion. “Evidently they do not allow knees in this fight.” Quadros says at one point, as Shoji is warned for kneeing Renzo in the clinch. Late in the bout, Renzo pulls guard. Shoji lands a few punches to body and knees to backside. Gracie gets active in guard, looks for a shoulder lock again, gets a nice hip bump sweep, right into mount. Shoji slips away beautifully from mount. The fight is tepid a lot of the way, but little moments like that are worth the wait. Still, Renzo can’t seem to get Shoji in position to look for a finish. Next, we see Koji Kitao, who reached the upper echelon of the sumo world before controversies killed his career and sent him to pro wrestling. It’s confusingly noted by the announce team that Kitao broke the arm of the “wife of a high class guy in Japanese sumo.” Here, Kitao takes on another 300+ lb pro wrestler in Australia’s Nathan Jones; and Kitao wins it quickly: a takedown to the mat to secure an Americana at 2:14 of round one. Not much to say here. Ralph White vs Branko Cikatic is next. The two heavyweight kickboxers begin with a touch of gloves (the old JKD style gloves, to be exact). Cikatic, who had a nice career with K-1 prior to this bout, immediately spins to hit a spin kick to the body. White goes on the attack with punch-kick combinations but stumbles to the mat, and Cikatic all but kicks his head off. Dale “Apollo” Cook, in White’s corner, screams for a disqualification. The announcers agree, but nothing is announced; and it’s listed as a no-contest, ending at 1:52 of round one. Next, Dan Severn and Kimo stare and paw at each other for almost a half hour of my life I will never get back. Even the ever-courteous Japanese fans boo. Severn gets a takedown and hits some good-looking punches and knees towards the end of the bout; which is yet another draw. Finally, it’s time for the main event. We pause for the Brazilian and Japanese national anthems — but the announce team speaks over them and ruins any atmosphere. Rickson Gracie makes short work of Nobuhiko Takada, hitting a picture perfect armbar at 4:57 of the first. I turn away from my laptop feeling a little sad now. I like to have some nostalgia for this period and there just wasn’t much of it to be found here — not in the presentation (which just doesn’t capture the history and atmosphere of the day) and to a degree, not really in the fights themselves. The confusion of this time — which could be fun, watching martial artists walk into something unknown — is the big takeaway. PRIDE events would get better, of course. But there wasn’t much to see in the first event, and not much to motivate you to go on to watch them in this way. If you want a look at this era, you’d be better served watching the Choke documentary, which followed Rickson Gracie’s preparations for Japan Vale Tudo 1995, instead.